Leading Judaica publisher Wayne State University Press (http://wsupress.wayne.edu) produced this remarkable art-size anthology on the diversity of dance in Judaism and in Israel in June 2011. The expert contributing writers come from Israel, Europe and the United States; their essays reflect the diverse views of dance historians, critics, ethnographers, sociologists and dancers illustrated with 182 remarkable photographs. The authors include Gaby Aldor, Felix Fibich, Zvi Friedhaber, Jill Gellerman, Ayalah Goren-Kadman, Yehuda Hyman, Judith Brin Ingber, Naomi M. Jackson, Elke Kaschl, Sara Levi-Tanai, Dawn Lille, Giora Manor, Josh Perelman, Dina Roginsky, Janice Ross, Barbara Sparti, Nina S. Spiegel, and Shalom Staub. See the Facebook group for related content, upcoming events and updates about Jewish and Israeli dance. View a few of the illustrations for Seeing Israeli and Jewish Dance. View full description, including contributing writers, for Seeing Israeli and Jewish Dance. "After many years of planning and research, Judith Brin Ingber has completed a masterful book on Israeli and Jewish dance." -Mordecai Specktor, "A Dance to Jewish Life," The American Jewish World, July 20, 2011. 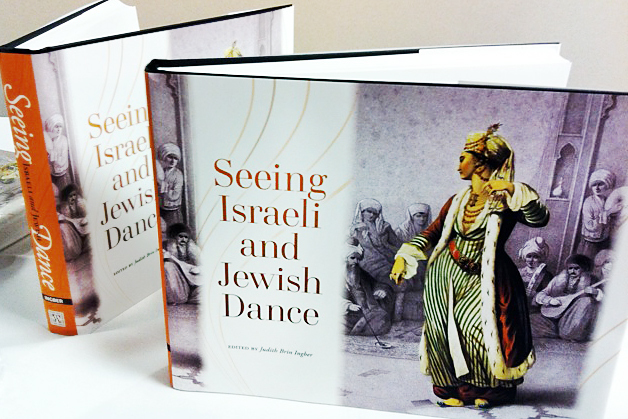 "Brin Ingber's edited volume Seeing Israeli and Jewish Dance offers a wide-ranging collection of studies of the encounter between Jewishness and dance. In the course of examining religious Jewish dances, Israeli folk dances and theatrical dances created in Israel, the contributors arrive at some surprising conclusions regarding the interde- pendence between Jewish and Israeli characteristics. The anthology also poses some essential questions regarding dance research, such as that of the boundaries between folk dance, social dance and theatrical dance." "Judith Brin Ingber has assembled in one volume a wealth of information and ideas. She and the sixteen other contributors to Seeing Israeli and Jewish Dance probe such diverse, yet profoundly related subjects as dancing in Judaic ceremonies and the creation of folk dances in the newborn nation of Israel. Dancing springs to life on the page—illuminating how cultural roots yield new blooms when transplanted into different soil. The reader will be stimulated by conflicting views about such topics as women's participation in traditional Jewish dances throughout history and the ways in which contemporary folk and theatrical dancing in Israel have honored memory and culture, even as they have altered the image of the Jewish body and what it means to be a Jew." "Seeing Israeli and Jewish Dance is work of great originality and importance, not only to the world of dance, but to the study of global Jewish culture and the arts. Its scope and depth are remarkable, and its combination of photography and scholarship is nothing short of thrilling." "Seeing Israeli and Jewish Dance is at once both cinematic and diasporic. It is part academic travelogue, part historical manifesto and part home movie, if "home" was all of Jewish culture across all of history. It intermingles the religious and secular practices of dance into a hybrid and fluid Jewishness: one with porous boundaries and a shifting sense of self, identity and purpose. In this collection of original and sometimes daring research, dance is framed as celebratory and artistic, decorative and efficacious, a kind of both/and construction which the authors liberally mine for its essential Jewishness and its contribution to the central issues surrounding Jewish identity, as both a part of and apart from the State of Israel. Seeing Israeli and Jewish Dance will undoubtedly inspire debate, critique and hopefully the publication of other texts that further explore dance in the frame of an ever-shifting Jewish identity." See Critical Reviews for additional information about Seeing Israeli and Jewish Dance. Jewish Book Council Tour took Judith to the Houston JCC, and Temple Beth Tikvah on Nov. 7 and 8, 2011; the University of Nevada and the Las Vegas JCC on November 11; and the Atlanta JCC on Nov. 13. Judith also appeared in Prague in December 2014 for the book, and will appear at USC in March 2015. 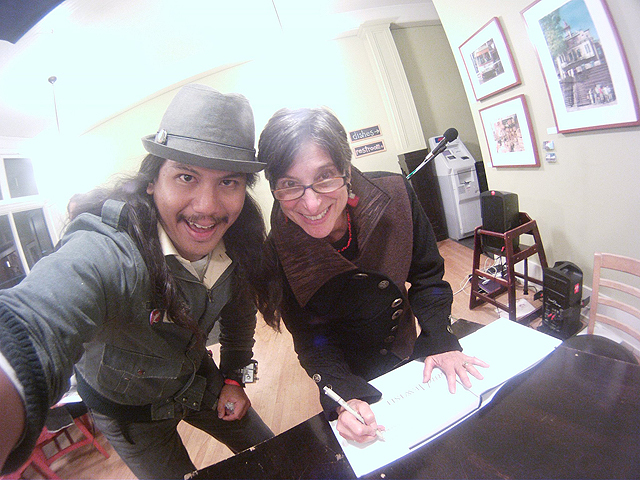 January 15, 2012 she had a full house at the 92Y book launch in New York along with author Judith Chazin-Bennahum. See photos of her book signings and travels in the Seeing Israeli and Jewish Dancefacebook group . Seeing Israeli and Jewish Dance. Ohad Naharin (inventor of Gaga)? Get expert information and writing about these subjects and more in Seeing Israeli and Jewish Dance. Leading Judaica publisher Wayne State University Press (wsupress.wayne.edu) produced Judith's remarkable art-size anthology on the diversity of dance in Judaism and in Israel in June, 2011. The contributing writers, experts from Israel, Europe and the United States, reflect in their essays the diverse views of dance historians, critics, ethnographers, sociologists and dancers. The essays are divided into unusual visual, dance-minded chapters including, "In the Spotlight," "Zoom in and Then Pan, " Cut Back to Europe;" "Going Live" and "Split Screen," illustrated with 182 remarkable photographs. Shalom Staub ("Wedding Dances of a Yemenite Jewish Village in Israel: Repertoire, Values, and Social Meaning"). 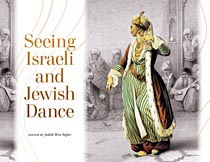 Seeing Israeli and Jewish Dance is available through Wayne State Univ Press and also Amazon for less than $40.00. Judith with her editor, Wayne State University Press's Editor-in-Chief Kathy Wildfong, at the recent book exhibition of the Association of Jewish Studies Conference. For further information, including photos, see the page for Judith's book, Seeing Israeli & Jewish Dance. Judith Brin Ingber with Dr. Ruth, at Jacob's Pillow. 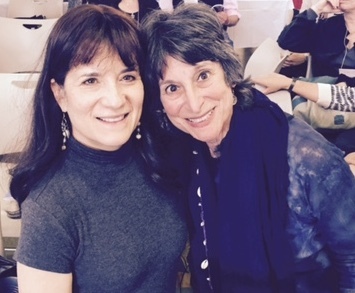 Judith Brin Ingber with Norton Owen, director of Jacob's Pillow Archive, at Jacob's Pillow. 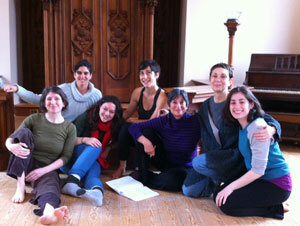 Judith Brin Ingber with Noa Wertheim, director of Vertigo Dance Company, at Jacob's Pillow. 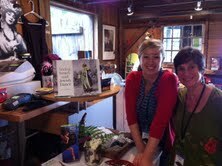 Judith Brin Ingber and her book in Jacob's Pillow bookstore. "I Danced Because I wanted to Say Something: American Jews and Dance" at the new National Museum of American Jewish History along with other artist/writers featured in her book, including Jill Gellerman and Doug Rosenberg. Also included was a performance of Anna Sokolow's "Kaddish" by dancer Hadassah Segal, followed by a book signing event on Sunday, Nov. 20, 2011 at the remarkable new building at Independence Mall East, Philadelphia. 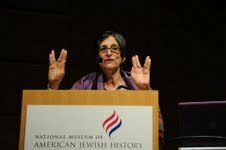 Judith Brin Ingber speaking at the National Museum of American Jewish History. The Association for Jewish Studies International Conference in Boston, Dec. 21, 2010. Booksigning at the Birchbark Book Store, Minneapolis, MN on September 15, 2011. V Paul Virtucio and Judith Brin Ingber at her autumn book program and signing at the Birch Bark Book Store in Minneapolis, Minnesota. 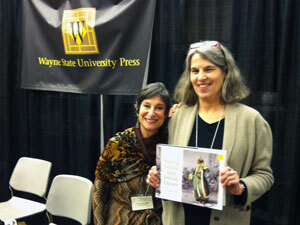 Judith Brin Ingber with Katherine Wildfing, Editor-in-Chief, Wayne State University. Wednesday evening, August 31, 2011 at 7:00pm, book signing in the beautiful Berkshire mountains at Hevreh, 270 State Rd, Great Barrington, MA 01230. 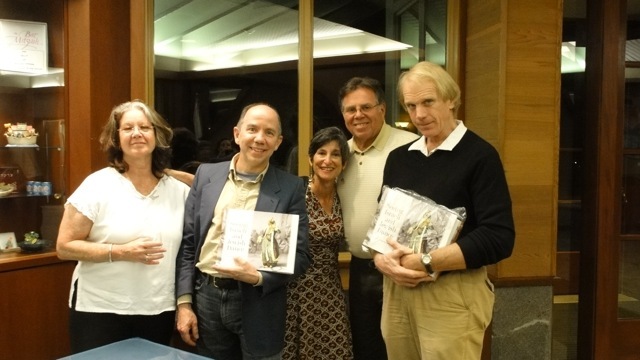 At the summer Hevreh South Berkshires book program and signing with sponsor Laurie Freedman; Jacob's Pillow archivist Norton Owen; Judith and her husband Jerome and arts patron Bruce Kelly. During a mini book tour in Napa Valley, at Congregation Beth Shalom and the Sonoma JCC in Santa Rosa. Judith visited Judd's Hill Winery, owned by presenter Bunnie Finkelstein. Left to right: David Brin (Judith's brother), Dr. Nina Schwartz, Bunny Finkelstein and Judith Brin Ingber. See photos of her book signings and travels on her Facebook site.